mrs sew & sow: I have got my shades on....! No not that sunny on planet Mrs Sew & Sow! But I just wanted to show you my first ever homemade lampshade! I bought a kit from my friend Karen some time ago and thought that looks like it will take time and concentration to do. But you know sometimes you are just wrong about how scary something is! This wasn't scary after all. Perhaps I should believe my friend Karen when she tells me something - I will be listening in future I promise! In fact the whole thing was fun! Enough stickiness to keep things where they should be but not so much that other things get glued too! I love the look of it and keep looking up to check out how pretty it is! 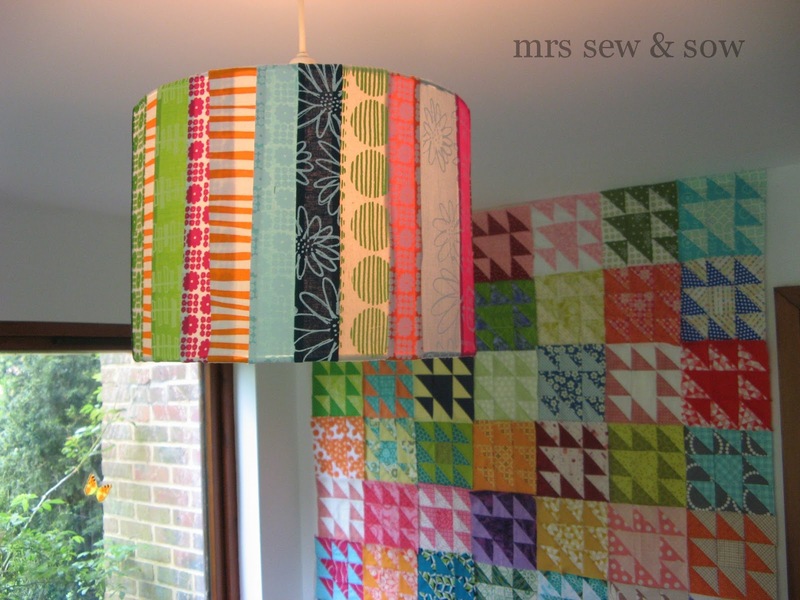 Two views of the same lampshade - but another is in the pipeline for the other light in my sewing room. And what else happened this weekend? And here they all are together - see I left that gap in my recent update for a reason! 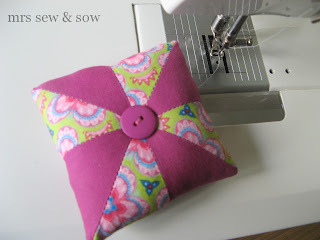 Janine also sent this cute pincushion - it reminds me of the time when we met up as Janine was looking forward to receiving some Tradewinds fabric from a giveaway she'd won! Love he lamp shade, nice stash too! I love your lampshade - they are on my list too! 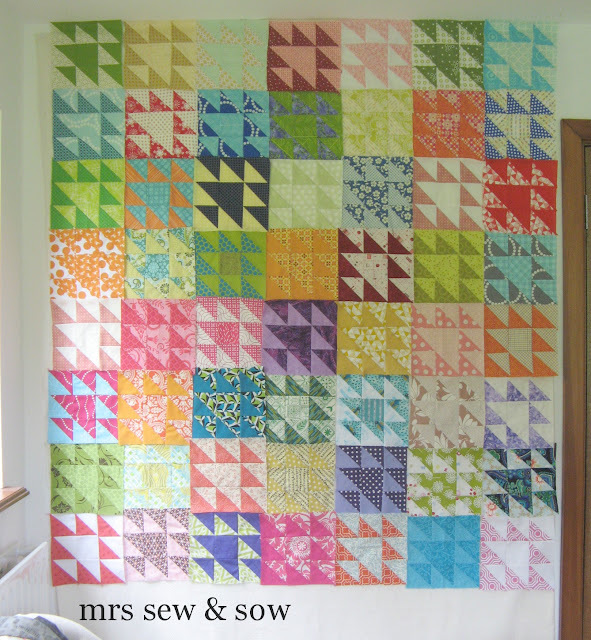 Fantastic shade and beautiful quilt! I love it! What a fab light shade. And admiring your stash in the background too. Love the lampshade and what a gorgeous little pin cushion! 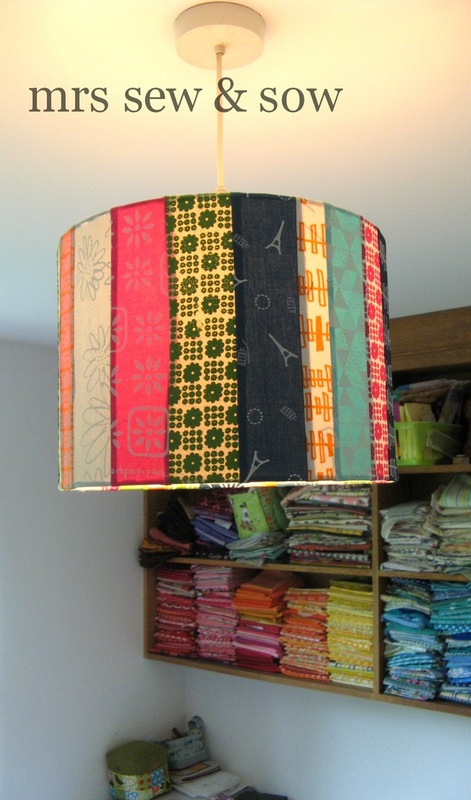 Perfect lampshade for a sewing room, great job! I love the lampshade, it looks so much better than the old one! 'Charmers' is looking delightful! I've never thought of making a lampshade. It's on the list! Yours is great! I made my first fabric lampshade a couple of weeks ago and was amazed at how easy it was too! Love those shades. Better add those to my want to make list. That looks so much better than the naked bulb hanging in my sewing room, I think I need to visit your supplier!!! yes you should believe me...when have I ever misled you?? It looks fantastic! Your bee quilt is looking fabulous. And the pic with that and your lampshade is gorgeous! Nice lampshade!!! !I love the colours!! Awesome. What a cool idea! I think my house could use a lampshade or two like this. But I really adore the quilt, I think I'll have to make one, it's fabulous! Where can I find a pattern/tutorial?